GitHub - LLK/scratch-blocks: Scratch Blocks is a library for building creative computing interfaces. Want to be notified of new releases in LLK/scratch-blocks? Scratch Blocks is a library for building creative computing interfaces. Scratch Blocks is a fork of Google's Blockly project that provides a design specification and codebase for building creative computing interfaces. Together with the Scratch Virtual Machine (VM) this codebase allows for the rapid design and development of visual programming interfaces. 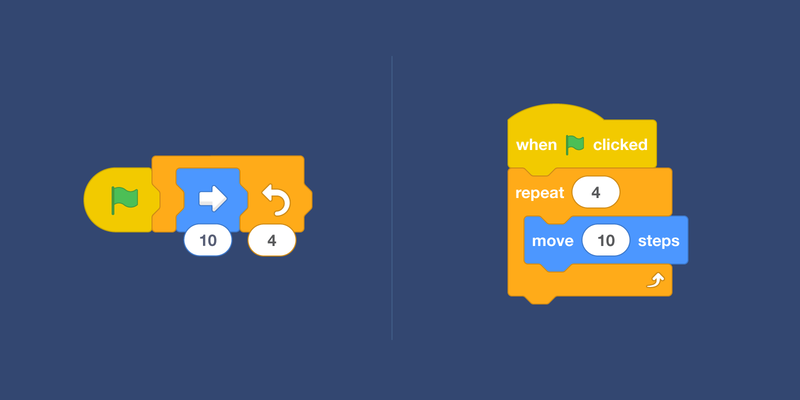 Unlike Blockly, Scratch Blocks does not use code generators, but rather leverages the Scratch Virtual Machine to create highly dynamic, interactive programming environments. This project is in active development and should be considered a "developer preview" at this time. Scratch Blocks brings together two different programming "grammars" that the Scratch Team has designed and continued to refine over the past decade. The standard Scratch grammar uses blocks that snap together vertically, much like LEGO bricks. For our ScratchJr software, intended for younger children, we developed blocks that are labelled with icons rather than words, and snap together horizontally rather than vertically. We have found that the horizontal grammar is not only friendlier for beginning programmers but also better suited for devices with small screens. The "getting started" guide including FAQ and design documentation can be found in the wiki. We provide Scratch free of charge, and want to keep it that way! Please consider making a donation to support our continued engineering, design, community, and resource development efforts. Donations of any size are appreciated. Thank you!